Here’s a new still from the highly anticipated live-action adaptation of Beauty and the Beast. 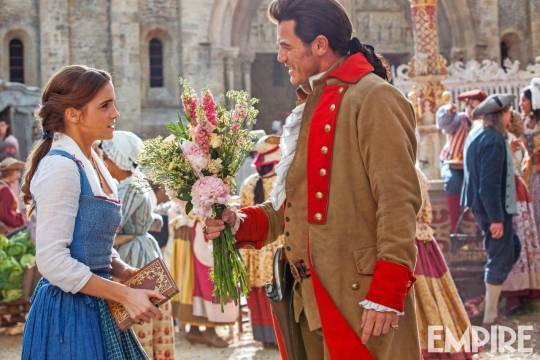 The still features Gaston (Luke Evans) offering this lovely bouquet to a very unamused, uninterested Belle (Emma Watson). One can deduce that this scene probably takes place after (possibly before) Belle and company sing the aptly titled classic “Belle” that we all know well from the original animated film. Emma Watson is clad in the iconic blue and white outfit we’ve all come to know so well over the last 25 years (yes, it’s really been that long!) The original Beauty and the Beast premiered November 22nd 1991, and it’s just as iconic and relevant as ever. The cultural impact of this film is indisputable, and the first full trailer even became the most watched ever within a 24 hour period. It’s safe to say that this film is going to be a massive success despite what critics and audiences will say at the time of its release. Time will only tell if this tale as old as time lives up to the hype, and delivers a balanced mix of originality and nostalgia. Follow NERD HALL for Beauty and the Beast news, and more!